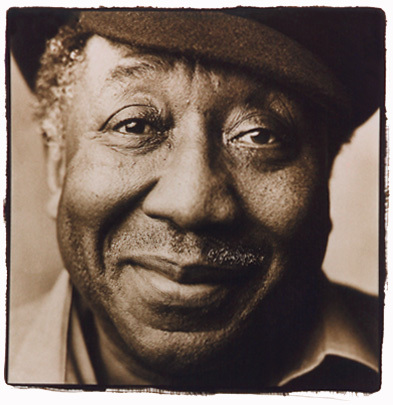 Listen to this track of Chicago blues elder statesman and natchel born lover’s man McKinely Morganfield, better known as the immortal Muddy Waters, good people. This is ‘Mannish Boy’, this version taken from Muddy’s 1977 comeback album Hard Again . The blues has had its ups and downs in the popularity stakes over the years. And for those not versed in the blues, it’s easy perhaps to dismiss it as simplistic, which may be one of the reasons why so many bluesmen faltered as rock music grew in stature in the 60s and 70s. In contrast, the blues seemed too basic for many. Ultimately, this comes down to how one feels about the basics, I suppose. And on Muddy Waters’ “Mannish Boy”, that’s what we’re confronted with – the bare bones basics that has fed blues, soul, rock, and to a large extent hip hop too. One person’s ‘basic’ is another person’s elemental. This tune is pure bravado, not unlike Bo Diddley’s very similar “I’m A Man”, which covers the same territory. Muddy had recorded this tune before, but this version under the watchful eye of producer and blues disciple Johnny Winter, has become the definitive version of the song. Winter had spent his whole life idolizing Waters, much like many blues rock musicians. Yet, when Muddy left Chess Records, Winter was the one who was instrumental in getting him a new contract on Blue Sky records, a sub-label of Columbia. Additionally, a band partially comprised of some of Waters’ 50s cohorts – most notably James Cotton and Pinetop Perkins – was assembled for the Hard Again sessions. Of course, the effort paid off. This is a seminal blues album, both as towering in its delivery as any rock album as well as being true to its roots which are arguably centuries old. Achieving this balance was always Muddy Waters’ strength. Here in particular, as Muddy and his band are in a one-chord-one-riff-call-and-response mode, we can hear what is typical of African music and early plantation labourer work songs. But this being Muddy Waters, everything is electrified in every sense, with Winter’s and Waters’ sideman Bob Margolin‘s enthusiastic hollers through out. Despite the rawness of this track, there’s something about it that’s epic too and as such can be looked upon as representative of the blues form itself. This is the sound of Moses coming down from the mountain, good people! It’s no wonder it’s been used in countless films, most notably by Martin Scorsese, who’s used it multiple times in Goodfellas, The Color of Money, and of course The Last Waltz when Muddy performed it live. Muddy’s comeback would be short-lived. By the end of the 70s, his health was in decline and in 1983 he was gone. But, he didn’t make his exit before one last burst of undeniable greatness. And this is it! The thing that makes this recording great is that vocal in the back that occasionally screams “Whoo!” or “Yeah!” or something similar. I love that part, which puts this song into a certain perspective. This song is meant to be performed live in a sweaty little club, it seems to me. Winter and Margolin’s whoops and shrieks really add to that vibe.